Raistlin is one of my two favorite Dragonlance characters, along with Tas (and the most popular character on this page). He reminds me of The Phantom of the Opera– tormented by others because of the way he looks and corrupted by this, the most brilliant of geniuses and talented to no end, yet hated and despised for the very corruption wrought upon him by others. An extraordinary character! I’ve seen anti-fifth age Raistlin sites that try to say that Raistlin is a one-dimensional character. These people disgust me, because Raistlin is not a one-dimensional character who must only be evil (for my reasons why see the psychology section at the end). Friends: Bupu, a gully dwarf he befriends in Chronicles and looks after is Raistlin’s most famous friend and weird Meggin, a fellow healer he works with in Solace; and Lemuel, a semi-mage mostly herbalist who befriended Raistlin before he took his Test. Astinus calls him a friend, and, indeed, they are both connected- Master and Lorekeeper of Past and Present. His laughter, rarely heard, is thin, high pitched, and sharp as a blade. It resounds in the minds of those who hear it and haunts their dreams. It denies goodness and mocks everything right and true. 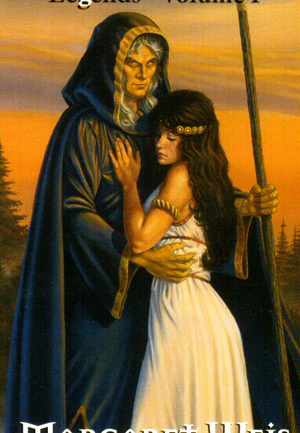 This is the picture of Raistlin found on the cover of The Companions, drawn by Clyde Caldwell. This is Raistlin before the Test, there is said to be only one pre-Test picture, which is not this one, but apparently that is not true. Unfortunately he’s shown wearing black beneath his red cloak and his eyes are brown, otherwise I adore this picture. The Soulforge begins “The Raistlin Chronicles” and chronicles the begining of Raistlin’s life and childhood. Raistlin was born in Solace and lived there his entire life until he took the Test at the Tower of High Sorcery, Wayrath. He studied magic at Master Theobald’s school, starting at age six, with his training paid for by a sponsor, Antimodes, (he actually trained as a white robe, making his progression from white to red to black the opposite of Magius‘s progression from black to red to white, which is interesting since he carries Magius’s staff). He did not play with his twin brother, Caramon, or any of the other kids, who would have taunted him, if not for his brother’s protection. His father died when he and Caramon were sixteen and his mother died soon after. At twenty years old, Raistlin was the youngest to take the Test at the Tower of High Sorcery, Wayrath. He was summoned to leave immediately after the departing of the companions. During his Test Raistlin’s heart is clasped by Fistandantilus, who is joined to Raistlin forever afterward, but does not defeat Raistlin. He becomes changed by the Test, his health is shattered (although Justarius comments that this is because he gave part of his life-force to a wraith), he sees everything decaying through hourglass eyes (though I have questions about the rate of decay and practicality of this), and Caramon has seen that he is willing to kill him (though Caramon continues to love him). After the Test, Raistlin is given the Staff of Magius to aide him and herbs to assist him with his shattered health (though they are bitter and do little more than ease his violent coughing). After the Test, in Brothers in Arms, Raistlin and Caramon join the hired mercenaries of Ivor of Langtree to practice their fighting skills. They end up practically leading the army, and defeating some of the Dark Queen’s newly forming troops (though they don’t know it). They also help save a city from the Dark Armies. Brothers Majere describes an adventure/mystery that Raistlin and Caramon solve. They end up saving cats and stopping the Dark Queen from entering Krynn (plus there’s a kender named Earwig- this book has everything). When the Companions meet up again after their five year absence in “Chronicles” (Raistlin is now twenty-five), Raistlin becomes the group’s mage. He fights along-side them in the beginning of the War of the Lance, but eventually takes to black robes and leaves the companions so he can work for the Dark Queen. By working for the Dark Queen he actually wins the war for the Companions. To slight her he lets them get what they are after and win the war. He slights Takhisis for a reason that we don’t discover until the Legends trilogy. Raistlin wants to get rid of the current gods (mainly Takhisis, Paladine, Gilean, and the rest of them, and become a god himself). He goes to the abandoned Tower of Palanthas, and, taking the dark elf Dalamar as his apprentice, starts plotting. He convinces Crysania, a young cleric of Paladine, that by going to the Abyss with him she can rid the world of evil. They travel back in time to just before the Cataclysm in Istar. Caramon and Tas both end up traveling back with them; Caramon has to learn not to depend on the helping others and train to become general of the army that Raistlin will raise after the Cataclysm. Raistlin becomes one of Fistandantilus’s students and Fistandantilus goes after him with the bloodstone bit, but there’s a struggle and Raistlin wins, we think (but we’re never quite certain, that’s how it tends to be with Raistlin and Fistandantilus). Now the whole Raistlin/Fistandantilus connection gets weirder. Raistlin goes around, pretending to be Fistandantilus, and re-living everything that happens to him. He has Caramon form an army, they get to the portal, he and Crysania enter the Abyss, Crysania takes over the fighting until she becomes too weak, then Raist and the Dark Queen have a huge battle, Caramon accidentally goes too far forward in time with Tas, he finds out about the fact that the Raist/Takhisis battle destroys the world and kills everyone, and goes to the Abyss to convince Raistlin to give up. Raist does and gets his guts ripped out every day by the Dark Queen until the Chaos War. For more info. on Raistlin’s attempt to become a god see Raistlin’s attempt at godhood. Right before the Chaos War, described in the forth Chronicle, Dragons of Summer Flame, Palin uses the portal to enter the Abyss and get Raistlin so they can win the Chaos War and not all die/disappear. They do, and everyone’s happy, except the readers, who are still crying about Tas dying, but Raistlin departs with the gods (probably because he has been a god before and they don’t want him messing around). Well, we should be done, but I can’t exactly say that we are. When Caramon dies in Dragons of a Fallen Sun, he sees Tika, but no Raistlin. He’s very disturbed by all of this and haunts Palin about not killing Tas, because things just aren’t right. Caramon is quite convinced that Raistlin should play a part in the trilogy, and so am I (but I won’t know until the bookstore finds out if they can even ship the book to Ireland). Psychology of Raistlin: If you’re looking for a one-sided bad guy, then you are bound to be disappointed. Raistlin is Margaret Weis‘s pet character, which means that he has to be complex and intriguing by default. The prequels (especially The Soulforge) set Raistlin up as someone who became evil largely because of the circumstances that bound him, who made no friends because no one would be his friend, who loved no one because no one would show him love. As a small child he is ridiculed by the other children for being different. In fact, Dragons of Autumn Twilight is riddled with comments made by the companions Raistlin grew up with against Raistlin, especially by Sturm and Flint who don’t trust magic. When things go wrong, Raistlin is accused by the companions, and they do not always admit how much Raistlin helps them in the War of the Lance. He often remembers his days at the Pig and Whistle Inn as some of his happiest because for once he was liked. All of his sarcasm, bitterness, hatred, and contempt are defence mechanisms set up to protect himself from the ill treatment he recieves from others. Raistlin is greedy for power, but this is partly because it is all he has. Because he does not believe he shall ever have love or friendship, he tells himself that he does not desire it. Raistlin does not believe that he will ever be loved partially because he catches the first girl who he falls in love with, and who flirts with him, sleeping with Caramon. Raistlin is also burning from within, Crysania describes his touch as hot and Par-Salian compares his life to the forging of metal. Hickman describes Raistlin’s struggle with the fire within, his passions, and compares it to Tanis’s passions. “To a great extent, Raistlin and Tanis both are victims of their passions, although ultimately we see each of these characters handle the problem differently. Tanis will come to accept it, understand it and harness his passions. Raistlin, in many ways, will become its slave.” (Tracy Hickman, The Annotated Chronicles, 965) Perhaps this is part of the reason Tanis often goes to Raistlin for advice, they are both seething with pent-up emotions. In Dragons of Autumn Twilight Raistlin’s interactions with Bupu, show us the feelings he is afraid to have or show, that he must hide beneath his sarcasm in order to protect himself. “Bupu rolled over to face him. Her eyes were red, her nose swollen. Tears streaked down her dirty face. She snuffled and wiped her hand across her nose. ‘I don’t want to leave you. I want to go with you,’ she said brokenly, ‘but- oh -I will miss my people!’ Sobbing, she buried her face in her hands. A look of infinite tenderness touched Raistlin’s face, a look no one in his world would ever see. He reached out and stroked Bupu’s coarse hair, knowing what it felt like to be weak and miserable, an object of ridicule and pity. “Bupu looked at him sadly, then -greatly daring- she caught his hand in hers and kissed it swiftly. She turned away, her head bowed, sobbing bitterly. Raistlin’s hatred towards his brother is not evil, but understandable. To him Caramon is everything he is not. Caramon is strong when Raistlin is weak, Caramon is handsome when Raistlin is not (at least not in the conventional sense, but he’s mysterious at least), Caramon is popular and liked by everyone and Raistlin… we went over that, and most of all Caramon is loved. Raistlin fell in love immediately with a girl who flirted with him, but he caught her with Caramon that very night. Throughout Legends Crysania’s love for Raistlin changes him. He does not want to admit to himself that he loves her, but he does. We see him struggling against the love he fears will weaken him in War of the Twins by Margaret Weis and Tracy Hickman. When Crysania, Caramon, and Raistlin awaken in Raistlin’s Tower after the fall of Istar, the Tower’s creatures surround them and Crysania’s frightened. “Kneeling beside him, she looked into his thin, pale face as he opened his eyes. Wearily, he nodded. Then, reaching up, he drew her down to him. Embracing her, he stroked her soft black hair. She could feel his heart beat. The strange warmth of his body drove away the chill. She could not speak, but only shook her head. He sighed again. Crysania, her eyes closed, lay in his embrace, lost in comfort. This show of affection, unexpected even by Raistlin, shows that Raistlin loves Crysania, but does not allow himself to love her openly. He’s terribly worried about her until he catches himself. His being stuck in the Abyss gives him plenty of time to think about things. When he comes out of the Abyss he has no hope of the power he wanted before, and he has already had enough power. If he seems changed it is only because he is focusing on different things, which, though not the center of his thoughts previously, were there all along. Raistlin was never just “really, really evil”. Those of you pouting about Raistlin seeming too good had better go back and read more about Raistlin. Raistlin despises his weaknesses and is angered by the pity others feel for him, yet he identifies with other weak things. He also does not like to feel indebted to others because of his weakness. Tas suggests that Raistlin knows that Caramon only helps him because it makes Caramon feel good- that Caramon is using him. Another aspect of Raistlin’s psychological makeup are his hourglass eyes. Par-Salian intends them to help Raistlin, but he is lucky they do not make him go insane, as they would many others watching the world constantly decay without end -many would find it unbearable torture. They serve only to make Raistlin angry (how would you feel if someone altered your vision to see only death? ), instead of loving. I think Par-Salian wasn’t thinking too clearly when he gave Raistlin the hourglass eyes. If you disagree with my analysis, you might wish to look at Another look at Raistlin- a letter.